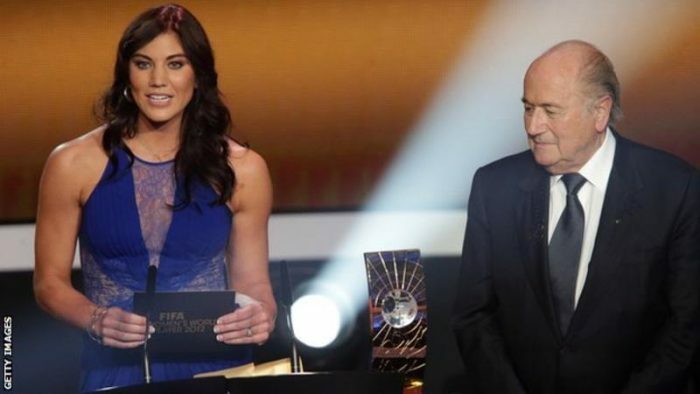 US goalkeeper Hope Solo has accused former Fifa president Sepp Blatter of sexual harassment. The World Cup winner, 36, says the incident happened at the 2013 Ballon d’Or awards, before she went on stage to present an award. Solo, when asked why she has not spoken out on the incident before, added: “I was nervous for the presentation. It was the Ballon d’Or I was presenting. “I’ve seen it throughout my entire career,” she said. “It’s not just in Hollywood. Blatter was head of the world football’s governing body for 17 years, until a corruption scandal in 2015. Fifa subsequently banned the Swiss official from the sport for eight years, a term later reduced to six years after appeal.